There are two kinds of alpacas, the alpaca Huacaya and the Suri alpaca. The Suri Alpacas have long shiny locks like very soft, slightly curly hair. Suri alpacas are much more rare and more expensive. The fiber of the Suri fetches a higher price on the international market. 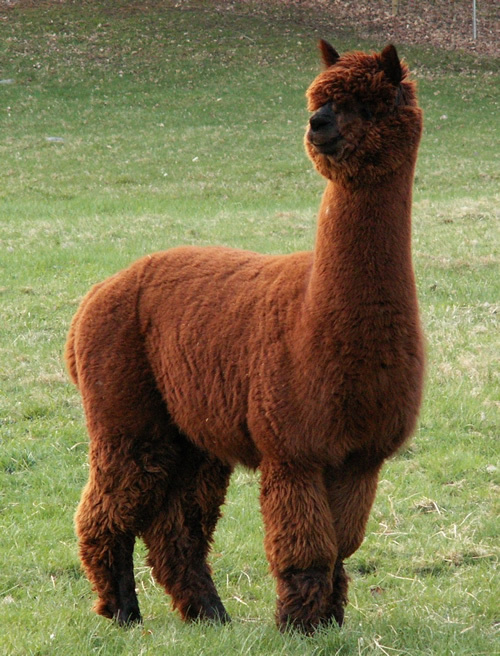 An alpaca (Vicugna pacos) is a domesticated species of South American camelid. Many confuse an alpaca with a llama because they resemble a small llama in appearance. The ALPACA SURI has the log and silky hair. Alpacas are kept in herds that graze on the level heights of the Andes of southern Peru, western Bolivia, Ecuador, and northern Chile at an altitude of 3,500 m (11,500 ft) to 5,000 m (16,000 ft) above sea level, throughout the year. Alpacas are considerably smaller than llamas, and unlike llamas, they were not bred to be beasts of burden, but were bred specifically for their fiber. Alpaca fiber is used for making knitted and woven items, similar to wool. These items include blankets, sweaters, hats, gloves, scarves, a wide variety of textiles and ponchos in South America, and sweaters, socks, coats and bedding in other parts of the world. 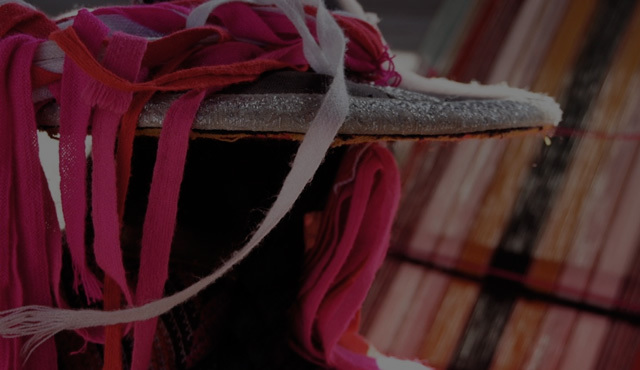 The fiber comes in more than 52 natural colors as classified in Peru, 12 as classified in Australia and 16 as classified in the United States. Alpacas have several different components to how they behave. They depend on their body communication to get their point across when they are threatened or happy. They spit when they are in distress, fearful, or to show dominance. Male alpacas tend to behave more aggressively than female alpacas because they want to have full dominance of their herd group. In the textile industry, "alpaca" primarily refers to the hair of Peruvian alpacas, but more broadly it refers to a style of fabric originally made from alpaca hair, but now often made from similar fibers, such as mohair, Icelandic sheep wool, or even high-quality wool. In trade, distinctions are made between alpacas and the several styles of mohair and luster. Huacaya alpacas are by far the most common type, constituting 90% of the world's population. 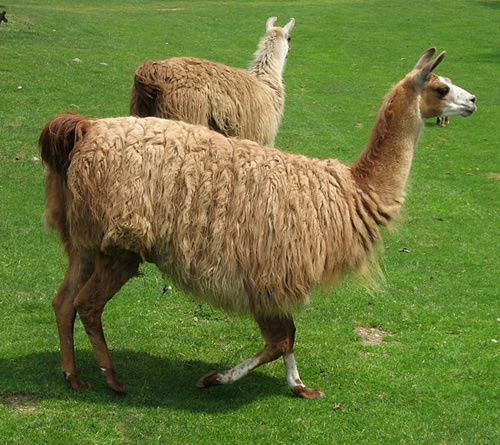 The llama (Lama glama) is a domesticated South American camelid, widely used as a meat and pack animal by Andean cultures since the Pre-Columbian era. The height of a full-grown, full-size llama is 1.7 to 1.8 m (5.6 to 5.9 ft) tall at the top of the head, and can weigh between 130 and 200 kg (290 and 440 lb) Llamas have a typical camel-like body shape, but they lack the humps of the Bactrian and dromedary camel. They have long necks, slender limbs, and rounded muzzles. They have protruding lower incisors (front teeth), and their upper lip is split. 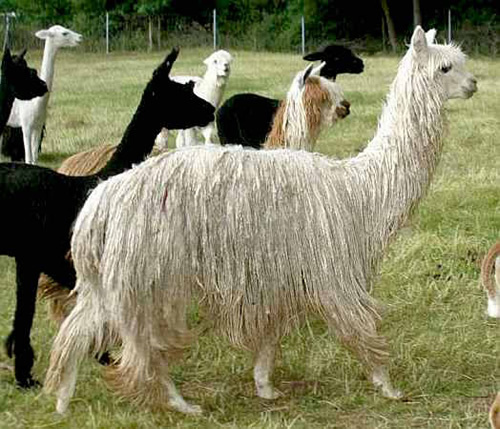 Partly because they have been domesticated for their wool, the llama can be found in a wide variety of colors, such as white, brown, gray, black, or piebald. One common pattern is reddish-brown fur with mottled patches of yellow or white. The guanaco (Lama guanicoe), a camelid native to South America, stands between 1.0 and 1.2 m (3 ft 3 in and 3 ft 11 in) at the shoulder and weighs 90 to 140 kg (200 to 310 lb). Its color varies very little (unlike the domestic llama), ranging from a light brown to dark cinnamon and shading to white underneath. 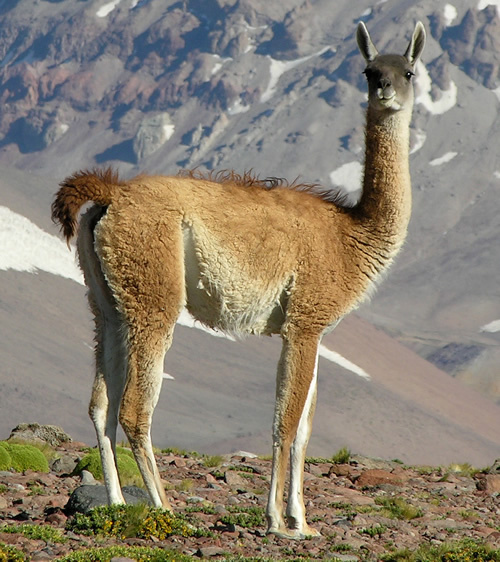 Guanacos have grey faces and small, straight ears. The name guanaco comes from the South American Quechua word huanaco (modern spelling: wanaku). The vicuña is one of two wild South American camelids which live in the high alpine areas of the Andes, the other being the guanaco. It is a relative of the llama, and is now believed to be the wild ancestor of domesticated alpacas, which are raised for their coats. 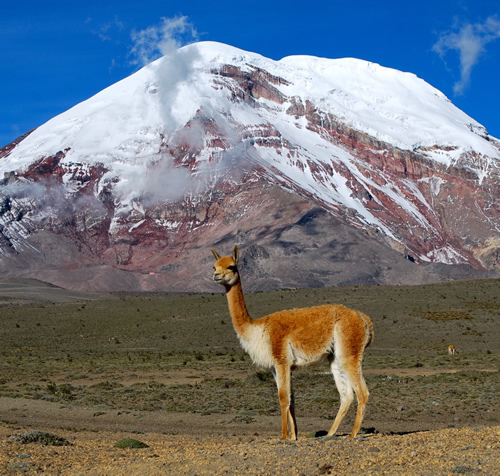 Vicuñas produce small amounts of extremely fine wool, which is very expensive because the animal can only be shorn every three years, and has to be caught from the wild. When knitted together, the product of the vicuña's wool is very soft and warm. The Inca valued vicuñas highly for their wool, and it was against the law for anyone but royalty to wear vicuña garments; today the vicuña is the national animal of Peru and appears in the Peruvian coat of arms.